Ratios can be a difficult thing to really understand when you are first starting out with frequency modulation synthesis, especially for those used to the subtractive synthesis process used in most synths. Ratios can be absolutely confusing. That said, they do not need to be for everyone. If you can grasp the basic relations between the numbers and notes, and how they measure up against what you are used to in subtractive (or “regular” synthesis as some people refer to it is) then you can begin to intentionally create the sounds you want to, rather than just stumbling into sounds that will work for what you are doing. You need to know that the ratio between consecutive semitones = 1:12th Root of 2 or 1:1.05946, and that moving up 3 semitones produces a raw and unstable sound, while moving up 7 semitones produces a clear, stable sound. That’s because moving up to ‘7’ is the same thing as having a ratio of 3. But believe it or not, you are actually moving up a perfect fifth as well. Make sense? Well maybe if you have a degree in music theory. (OK, some of you out there have a good understanding of this, and do not hold a degree. We recognize that.) But at least this is the beginning of the demystification of FM Synthesis and ratios for you, and you can then begin to figure out what your questions actually are from here and start finding the answers. This is a daunting subject for most, but it is one that may prove to be absolutely essential for many people getting started with sound design and FM Synthesis. FM8 makes a lot of this easy for you to work with, but really understanding it is something else completely. Below is a chart which could be confusing to some, and priceless to others. What we have here is a conversion table. 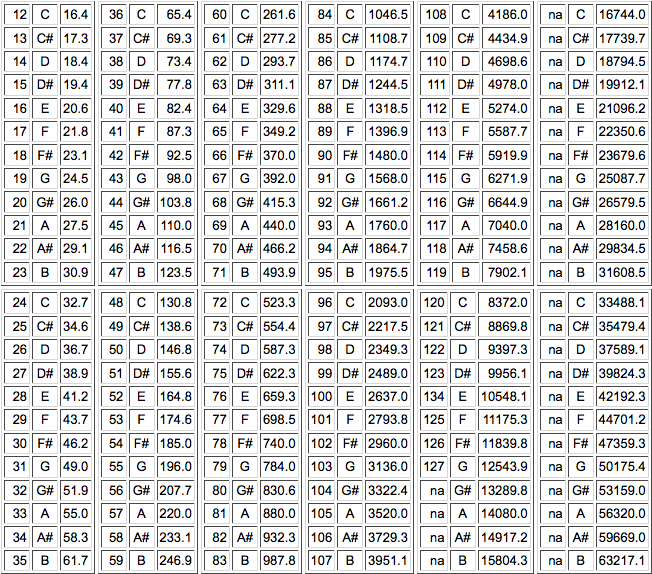 It shows you the midi value, the corresponding musical note and the relative frequency measured in Hertz. Middle C is represented at the top of the second column, with the Midi value of 60. Needless to say, there is a deeper knowledge of frequencies, math and music in general to really get the most out of FM Synthesis, and therefore Native Instruments FM8. But once you begin to unravel the secrets, you can be guaranteed that you will be a better musician and producer for it! We hope to be a part of that learning for a very long time to come!! This is obviously a topic that we could continue to go much much deeper in-depth, but alas this is a simple blog post and students of music devote years of their lives getting to a place where they can speak this language. And although we have barely even begin to scratch the surface with this basic lesson, we need to wrap it up here and let you all go and play with this new knowledge a bit.